This wedding image was taken in Niagara Falls at Delphi Banquet Hall while I was documenting a wedding with my second shooter. It was one of my most difficult to achieve images and one of my most beloved pictures. Photographing a moving object at a low shutter speed is not an easy task. 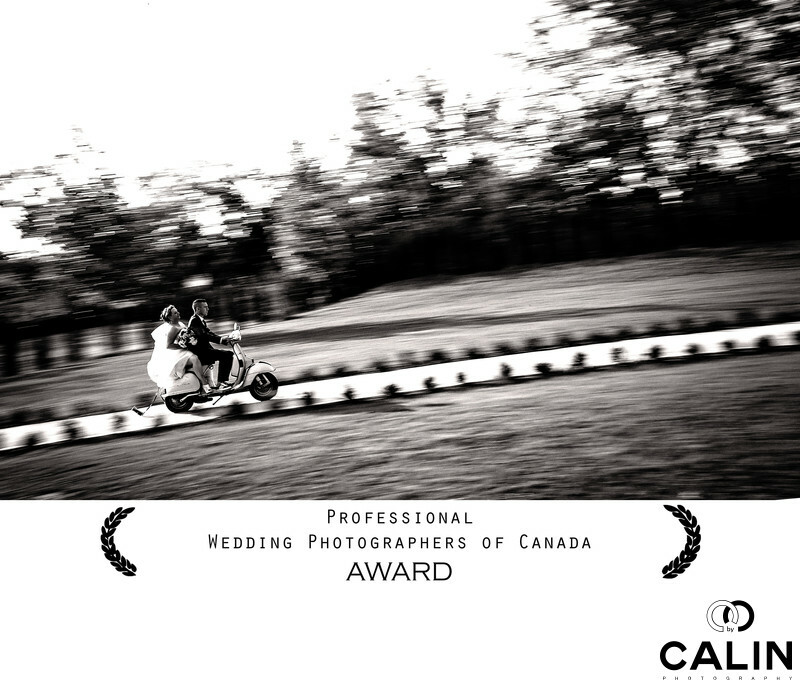 The image received a Professional Wedding Photographers of Canada award in the Movement and Motion section. As a Toronto wedding photographer, I love documenting weddings in the Niagara Region. As an artist, I am blessed to meet new people every weekend and I am honored they hire me to document their wedding day! As such, I train constantly to be able to offer the best wedding pictures possible to my clients. This particular image is the result of many hours of practice to make sure my camera follows the photo subject - in this case the couple on the Vespa- at a constant speed. The result is that the bride and groom are visible/sharp while the background is blurred. It was such a hot day that the bride and groom decided to take all the formal photos inside Delphi Banquet Hall in the comfort of air conditioned and cold drinks. That was a great choice, especially enjoyed by the bridal party, some of whom traveled from England to be present. The groom was originally from England and his best man was from his hometown. All the guests were relieved when the bride communicated everyone that only the bride and groom were going out for the photo shoot. I will admit that in my travels I have rarely seen such a relaxed couple. Despite the fact we did not have enough time to photograph and it was very hot, Instead of rushing to the photo shoot, the bride and groom were chatting, making jokes and really enjoying their day. The groom even invited me to join him on a ride on his Vespa, which I gladly did. It was hillarious to see the photographer ride the scooter behind the groom, while the bride was taking photos of us!!! After a few good minutes of enjoying the ride around the banquet hall, we returned to the garden behind the venue and I asked the bride and groom to jump on the scooter and take a few turns up and down the little hill. They had some beer cans tied to the scooter in a typical European style and were making a lot of noise, not to mention the cans kept flying in all directions...if you pay close attention to the scooter, you can see there is a can in the air, which adds to the sense of motion. Many people asked if this photo is Photoshopped...the short answer is no, the photo was created in camera and just turned black and white in post processing. Was is a photojournalistic wedding photography moment? Yes and no...No because I asked the bride and groom to ride the scooter at a high speed behind them :-)...and YES, because the bride and groom had so much fun that they made the photo great...I was just there to take the shot!!! Location: 4414 Portage Rd, Niagara Falls, ON L2E 6A7, Canada.